On July 1st, Mark Fayne was signed by the Edmonton Oilers to a 4 year contract with an Average Annual Value of $3.5 million per year. I will start by saying that this is a phenomenal signing for both the Oilers and Fayne. Over the past few seasons, Edmonton has gained a reputation for being a "top-heavy" team, with strong forwards, but severely lacking in defense. This has resulted in Edmonton having top 5 draft picks in 4 of the last 5 years in a re-building process that has been going on for what seems like forever to Edmonton fans. However, contrary to popular belief, Edmonton has some very promising defensive prospects coming through the system, such as Darnell Nurse and Martin Marincin. After watching a lot of Mark Fayne this past season, I can say that he is not a liability in any of the 3 zones he can play in. The 6'3", 210 pound defenseman does not bring a physical game. This past season he registered 77 hits in 72 games played. In the beginning of the season, Fayne sort of floated around the defensive pairings until he found his role on the top line with linemate Andy Greene. Fayne is not a strong offensive presence, as he had 11 points last season (in his 72 gp). What I've seen from Fayne is that he is very reliable at keeping the puck in the offensive zone when the team is attacking, and has great pinches. His significance on defense specializes in checking. Not conventional body checking, but checking in the sense of body positioning and defensive stick handling. While not a top-pairing defenseman, Fayne will be able to fit in wherever he is needed. Above is what's called a Player Usage Chart. Essentially it tracks zone start percentage for a player (the further left a player is, the less offensive zone starts he has). 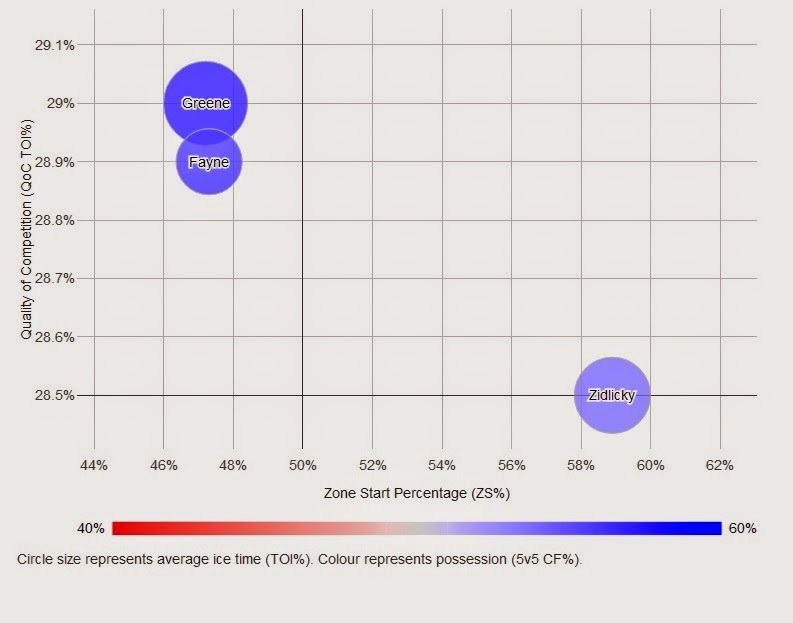 It also compares that zone starting percent with the player's corsi and quality of competition stats. The size of the circle is indicative of the average ice time a player gets. So, there is a tremendous amount of information presented in the small graph above. Thinking about it all can really give someone a headache, so I will keep it simple: the higher a player's circle means the higher their corsi rating is. The corsi stat is a measurement of possession, and there is usually a positive correlation between higher (offensive) zone start percent and higher corsi (possession) stats. The fact that Fayne's corsi is so high, despite a low offensive zone start percent is a good sign that he is a defenseman with strong puck possession skills. Last season, Fayne posted an overall corsi rating of 55.3%, which was above the team (New Jersey Devils) average of 54.6%. Why is this important? Because New Jersey was one of the best possession teams in the league last year. Their corsi percentage was 4th highest in the league. In today's NHL, possession is a strong element of success. (The only exception to that last season would be Colorado, but I will address that in another write-up). Edmonton sat in 28th in the league, last season, in possession ranking, with a corsi rating of 43.4%. So, immediately, Fayne will have an impact, in the sense of an improvement in the possession column. So how do possession stats translate into defensive effectiveness? Corsi is a measurement of any shot attempt towards the goal, which includes saved shots, blocked and missed shots. If a player has a Corsi higher than 50%, then his team throws the puck toward the opponent's goal more times than the puck is thrown on his own goal when he is on the ice. For example. Hank is on Team A and steps onto the ice for a shift when the puck is taken through the neutral zone into Team B's zone. There, 2 shots on goal and 1 missed shot, and 2 blocked shots are recorded (this is a total of 5 corsi events). Team B then takes the puck down to Team A's zone and takes 2 shots and records a goal (this is a total of 2 corsi events). While a goal was scored, affecting his +/- stat, Hank has a corsi stat of 71.4% recorded during his shift. Many variables can affect a player's corsi stat, however, with a greater sample size than a single shift, a distribution starts to form and the player's average corsi really starts to take shape. Something important to address here is a possible inflation of Fayne's stats from having such a good linemate in Andy Greene. To this, we turn to what is called WOWY stats, or With Or Without You stats. These are measurements of differences in performances between linemates. Found on stats.hockeyanalysis.com, these stats can be determined. Below is a screenshot of the info. The text is a little small, since I only focused in on Fayne's relationship with Greene. Here are the most important numbers: When the two were on the ice together, Fayne had a corsi percent of 55.3, and Greene had a 57.6% corsi. When the two were apart, Fayne had a 47.2% corsi, and Greene had a 54.2% corsi. So it is important to note that there was about an 8.1% inflation of Fayne's corsi numbers when playing with Greene. However, it is not exactly a one-way street, as Greene saw a 3.4% inflation to his corsi stats when playing with Fayne. What is important to note is that, even independent from his steady linemate from last season, Fayne's independent corsi (possession) stats are higher than the Oilers' team average. As for where Fayne will play, I can definitely see him matching up well with Andrew Ference, or whoever is on the second defensive pairing. His play on the Devils' 2nd penalty kill unit will also transcribe well into Edmonton. It is possible to see him spend time on the Oilers' 1st penalty kill unit. All in all, Fayne will bring defense to the Oilers by bringing a consistent possession game, as a well-positioned shutdown defenseman role. With Ben Scrivens in net, and a year of Dallas Eakins system under the belt, as well as rising defensive prospects and the signing of Mark Fayne, we should see a much better Oilers team this coming season. The numbers and services I used in writing this came from Extra Skater and Hockey Analysis. Interested in more? I'm on twitter now, @DTJ_AHockeyBlog. Give me a follow, as well as some feedback!